Home » Peace & Politics » How can xenophobic Christians be so passionate about hating immigrants? How can xenophobic Christians be so passionate about hating immigrants? There are a lot of things I’m passionate about: Jesus, poverty reduction, community, evangelism, revival and many other things. But one thing I’m not passionate about is being a racist. Racism is terrible and insane and I’m praying every day that i will treat everyone equal, with love and dignity, and that the Holy Spirit will give me a humanitarian passion for everyone that is in need. 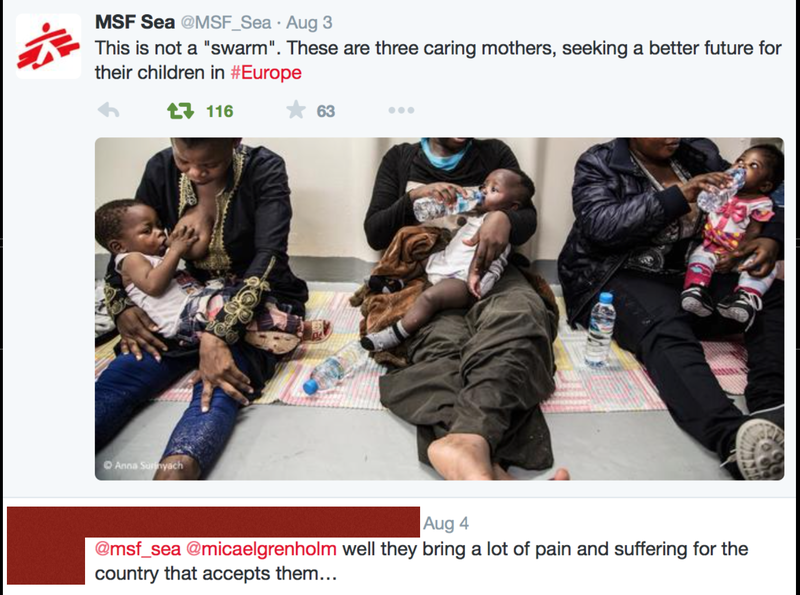 And so when I retweet Doctors without borders who point out that refugees are people who seek a better future for themselves and their children, I am devastated when another Twitter user responds with racism. Yes, this is racism, he knows nothing about these mothers other than that they are African, and yet he argues that they “bring a lot of pain and suffering for the country that accepts them”. Cold, hateful racism. And this guy claims to be a Christian. Some will just tell me to ignore the trolls and go on with my life, but these comments don’t come from isolated dark corners of the internet anymore, this is a mass movement all across Europe that is occupying parliaments and governments. A movement filled with hostility against people from Africa and the Middle East, a movement promoting inequality, deportation and white supremacy. I’ve encountered Christians involved in this movement who are extremely passionate about kicking out black and brown people form their country. How can they be so passionate about such an ugly cause? Why aren’t they passionate about something beautiful, like following Jesus and helping the poor? I think quite frankly it is because the racist and xenophobic movement has a gospel of their own, a story about the salvation of the fatherland, while it is fully acceptant of sin. Hate and immorality are not condemned, they are welcomed. The only sins are to bless and welcome Muslims and other strangers, which the people involved in this movement aren’t interested in anyways, due to fear and egoism. But I continue to pray for humanitarian passion. For a church that refuses to ally with xenophobic logic and that continues to stand with the oppressed and poor even as new gas chambers are being built. We will stand for what is right, just and loving no matter the consequences. That’s what following Jesus is all about. By Micael Grenholm in Peace & Politics on August 5, 2015 .
excused with flimsy reasons. If a Christian follows the Bible and accepts that homosexuality is wrong, he is accused of have a phobia…he is crazy. rational. I have never heard of Caucasion phobia or anti-Christian phobia. Caucasians, especially Americans, who are not excited and accepting of immigrants who come into the country with little or no skill, no money, no means of making a living, and moral standards that are contrary to Christian morals. The liberal’s explanation: These Caucasian Christians should set aside their Christian opinions and be tolerant of new ideas on morality. Also, they should accept a lower standard of living and not complain. would feel the same about “poor white trash.” Caucasian Christians will step up quicker than any other to give a helping hand. They are the most generous group on earth…..and the most criticized. No other group is expected to be generous. Liberals dismiss other groups as children who cannot help themselves. If groups other than Caucasian Christians kill Caucasian Christians or any Christians….it is NEVER xenophobia. It is excused as righteous anger….caused by Christianity, of course. You may know something about your friend that we don’t, but the words you quoted are bit racist. Uncontrolled immigration is a problem for adult thinkers, Christian and otherwise. As families and individuals our hospitality has limits; it is no different for a wise nation. We cannot directly minister to everyone. Calling people racists is one of the cheapest shots you can take these days if you are trying to ingratiate yourself with the governmental, religious and media elites. Jesus would have nine of it. That was supposed to say “none” not nine at the end, and “not racist” rather than “bit racist” at the opening. Even the I-phone doesn’t want to hear this caution, I guess. Hello Howdy! Again, the only thing this guy knew about the three women on the picture was that they were immigrants from Africa. He had no other information what so ever. Yet, he’s being sure that their presence means “pain and suffering” for the welcoming country. He knows nothing about their religion, culture, professions, education or wealth. He just knows that their African, and that makes him think that their presence is bad. That’s not just being xenophobic, that’s not just being against “uncontrolled immigration” – that’s literally being racist. Its similar to me seeing a picture of some Jews saying “Of those guys will destroy the country they live in”. To imply that African women will automatically be bad for the country they live in, even though they may be very productive, pay taxes and contribute to society, can be nothing else than pure racism. And by the way, the West has enormous capacity to receive immigrants compared to the developing world, where currently 80% of global refugees flee. Its ridiculous and pretty horrifying when the West allows refugees to die, saying “we can’t help everyone”, when they receive far less immigrants than they’re able to. Pakistan, Jordan, Lebanon, The Republic of Congo and other poor nations receive most refugees, because the West makes it extremely hard for refugees to go there. The West needs to help them where they are. Ask the ancient Romans, Greeks, etc. what happens when your country is no longer Roman or Greek. Bringing in immigrants in huge numbers will completely change your country to the point you will no longer recognize it. Now your country is no longer fit to immigrate to. I think that it would be best for 20 million muslims to immigrate to Sweden and turn it into a muslim stronghold. And get rid of Christianity…which seems to have so many flaws according to so many of your posts. Just because the US has a few extra empty acres, does mean we need to fill it up with muslims. Empty acres have value, also. Controlled Immigration is not a problem. What is a problem is illegal aliens pouring across the US border. It is like poison to our schools, hospitals, and jobs. They pay no tax that would pay for some part of this. The schools are being forced to teach at the lowest level….ignoring the A and B students who are our future leaders. There is no love and respect for America. Money made here in the US is sent to Mexico or elsewhere. They do not pay into the Social Security retirement system, but they will be given a retirement allowance, anyway. They live at the hospital emergency room where they get free care. Well…not free . The American fools pay for this. It comes out of the pockets of the middle class taxpayer. I know….I know. In your hippie point of view, we should not worry about Russia, China, an muslims cutting our throats. When the US fails and goes broke, the whole world will feel the wrath. When you criticize the Russians, Chinese, and muslims….they will not debate you….they will kill you. That will be so much better. Islam brings slavery, ignorance, and death wherever it is allowed to exist. There is no plus. Any country that is backsliding with Christianity cannot stand against islam. You are worried about Christians being xenophobic? Are you concerned about muslims killing Christians in Africa, middle east, China, etc.? You are worried about Christian attitude….but not a word about murderous muslims. Many Mexican immigrants are Christian and thus Jesus’ brothers and sisters. And even those who aren’t should be treated with love, compassion and respect. “Illegal” means nothing morally, everything Hitler did was legal and most things Martin Luther King did was illegal. It was illegal to save Jews during the holocaust – did that make it wrong? The US is the richest country in the world so it’s not a problem that Mexican immigrants send money to their poor families at home. You should share so that everyone gets what they need, as John the Baptist said (Lk 3:11). If you want to complain on tax money disappearing, pay some attention to the super rich 1% – they tax evade like crazy, robbing people like you from billions of dollars. But maybe your like the unrighteous Christians James warned about, who blame the poor and defend the rich even though it’s the rich oppressing you. Could you please put the RACIST word to rest. NONE of what I have said points to racism. You making ridiculous comparisons of today’s world and the time of Jesus in Israel. The immigrants of the time of Jesus were not hostile toward Israel or Judaism or Christianity. That is never mentioned in any Bible story. Here in the US, we now have the worst President in our history. He is a communist, an full time atheist, part-time muslim, and he despises America. As he promised, he wants to transform America. That means we wants to reduce America from the leader of the world to a country that is struggling to exist. He wants the country to be overrun with anybody who is not Christian and is not Caucasian. He learned this hatred of white men and Christianity from his mother. So, that is what we are facing…millions and millions of illegal aliens pouring across the border who have no intention of assimilating. They do not want to join America. They want to keep their own culture. They have no interest in leaning about America, only how to get free healthcare, free school, free food, free anything. And all of this at the expense of the regular Americans, whom the illegals despise. Does that sound like a Bible story? You must be dreaming….that perhaps only 500 illegals came in one year. We have at least 30 million illegal aliens. Our schools systems are flooded and the hospital emergency rooms are flooded with illegals who pay NOTHING. Our sorry politicians are such prostitutes. They constantly pass legislation to give the illegals more and more. It is very difficult for a teenager to get a job. Obama is destroying the morale of the military by promoting unqualified, incompetent officers and firing the good ones. The Supreme Court and approved homosexual marriage and marijuana is being approve everywhere….totally against the Constitution. Obama is using illegal aliens to destroy our country. that is why illegal aliens have become the number one issue in the upcoming election. The USA is sick.